PALM SUNDAY IN PONTELAND was different this year. 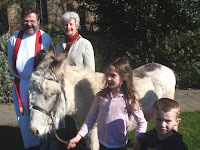 The new vicar, Peter Barham, wanted a meaningful event and brought in a donkey – all the way from Prestwick. Members and friends were welcomed at the car park of Coates School on Thornhill Road and handed palm crosses and service sheets. Jazz, the twelve years old donkey, was well behaved and the centre of attraction for all the children. Reverend Peter said that in the C of E the first time an event runs it is innovation and the second time it becomes a tradition, possibly in anticipation of a repeat performance next year. 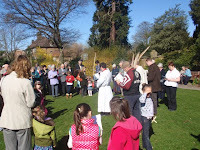 The vicar, assisted by the curate, Tim Ferguson, led the procession along Thornhill Road in the warm spring sunshine, with stops at the green places to sing another hymn and have another reading. The finish was on Coates Green and the donkey, much admired, returned home and the participants joined the congregation already in the church to conclude a memorable Palm Sunday.